Anna Maria Bianchi is the president of the association “carteinregola”, an initiative aimed at promoting collaboration between citizens and committees as well as other associations in Rome. 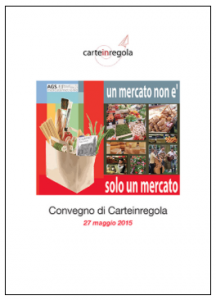 Among the activities offered by “carteinregola”, Anna Maria is in charge of the initiative “We defend neighbourhood markets”, which she will present in this interview. She not only highlights their interest in defending the commercial function of markets, but also focuses on the social role of these neglected sites, which once represented the identity of the city of Rome. How was the initiative We defend neighbourhood markets born? My experience with neighbourhood markets began when I first started taking care of the issue of underground parking lots. Indeed the urban parking lots plan that was implemented in Rome was totally advantageous to the private but not to the public sector, nor to the safeguard of the rights and safety of the residents of the area. Hence in 2011, thanks to the coordination of NO PUP committees, (fighting for a sustainable and transparent urban parking plan) a major battle against a resolution made by the municipality of Rome began. The resolution established that three covered markets in Rome, public properties specifically situated in the prestigious neighbourhoods of San Giovanni, Parioli and Trieste, were to be assigned to private companies, without previous contest. The decision made by the municipality aimed at providing the markets with the enlargement of their underground parking lots. The market area would still be public property but the construction of parking lots underneath and luxury apartments above would have left the commercial areas with heights not compliant to those required for a neighbourhood market. The activities that resulted from the coordination of the NO PUP committees started with the battle in defence of the Metronio market in San Giovanni, a work of great architectural value. During this battle in 2011-2012, we gathered professionals of diverse competences, such as architects, neighbourhood committees, NO PUP, associations linked to mobility and some market workers. We met for a first convention in 2012, then again during a four months long garrison to the seat of the municipality of Rome, after which the resolution was withdrawn. Eventually, the groups that fought together against the resolution decided to create carteiregola, an association made up of various working groups, among which one is focused on markets: We defend neighbourhood markets. What are the activities you have been involved in? With time we have tried to create a coordination among the workers of the covered markets in order to reevaluate these areas not only as commercial sites but also as crucial components of the identity of the city of Rome. As explained in our publication “A market is not only a market”, we have a very romantic idea of markets. When I was young, but even in recent times, markets were meeting points for every kind of initiative, where citizens talked and debated. Today markets are not as busy as they used to be, people tend to only go to the market in the morning. In my opinion the idea of the market as the heart of the neighbourhood, as a meeting place and as a space for human relationships has lost its strength. Most of the urban population does not go to the market, mainly because of its restricted opening hours but also because of little convenience. Nowadays, markets’ customers are mainly older people or families with children. This situation makes it even harder to design and implement a project of reevaluation. We believe that the revival of neighbourhood markets is a complex operation that requires innovative formulas through which citizens can rediscover the value of building a relationship with the surrounding territory. In order to do this, markets should offer a variety of products and also of spaces dedicated to the youth but also to artisans and public services. We have noticed that a democratic process, involving the markets’ workers is not feasible, even if in principle we wanted the workers to be the protagonists of the struggle. As a matter of fact, the unions that deal with commerce and markets are barely in contact with the workers. For instance, at the time of the resolution I have talked about earlier, the workers were totally unaware of the events. Nonetheless, we cannot deny the fact that some typologies of workers operating in markets are also problematic. There are certainly very enlightened and active people, such as Alessandro Albanesi, president of the AGS Metronio. However, most of the workers are still bound to a familial kind of working tradition. Also, there is an increasing number of foreigners, who are usually hard to reach and to involve, for they are usually either running the market stalls on behalf of someone else or in conflict with the rest of the Italian workers. Moreover, one should also consider the issue of habits, for which the operators of a commercial activity who are used to certain working time shifts, are reluctant towards change, for it puts at risk their certainties. For instance many workers are suspicious about an eventual increase in production fees. On the one hand, their complaints are justified by the fact that most of the markets’ structures are not appropriate to allow for competition within the sales business. As a matter of fact, the revival of markets is also linked to a more advantageous economic situation, which is not the case of today. A lot of resistance is also made against time shifts. There have been many experiments in which markets have tried to open stalls during the afternoon, but a similar organization is hard to manage, for market activities run by a familial tradition have a hard time providing an efficient workers rotation. Overall there are huge problems that are made worse by a serious lack of interaction and involvement. We have tried and we are still trying to create some enthusiasm by involving the most active and dynamic elements among the workers. However, we noticed that during the last meetings, despite a fair participation rate, the overall behaviour was mainly aimed at managing mere administrative issues. Actually, what we are aiming at is the creation of a strong web of market workers helping each other with all sorts of issues that do not only refer to administrative concerns. Indeed, it is really hard to come up with an effective process, capable of involving local professionals and revitalize markets. Undoubtedly, success in the market environment is closely dependent on the initiative of every single operator, who in turn inspire and engage their colleagues. This dynamic is nonetheless often unproductive. All these issues urged us to reconsider our strategies. Moreover, we will have to wait to see what position the new City Council will take regarding neighborhoods markets. I have to admit that an initiative spearheaded by the City Council would save us a lot of time and effort. In the eventuality of such an institutional leadership, we would still oversee the process, making sure that such initiatives provide for citizens and operators’ participation, despite being top-down. My fear is that the public administration is going to rush into taking shortcuts, privatizing the market areas and creating a fake and contrived environment. Moreover, such an initiative would transform central markets into places which rely upon the existence of a lively nightlife, causing the abandonment of suburban markets. Do you completely rule out the possibility of involving a private partner in your vision of neighborhood markets? Absolutely not! As usual, one should not condemn the model itself but its actual use. The problem with the intervention of private entities is that these solutions have often resulted in a Trojan horse situation thanks to which the private profits without giving back an equal return to the people and operators who live and manage the market everyday. Often times such initiatives are indeed planned out by some kind of elite, unbeknown to the operators. An ideal project would feature market operators, citizens, municipalities and public institutions working together with the private sector, rightfully creating a profit, which should however be functional to revitalize the market and not destroy its potential. 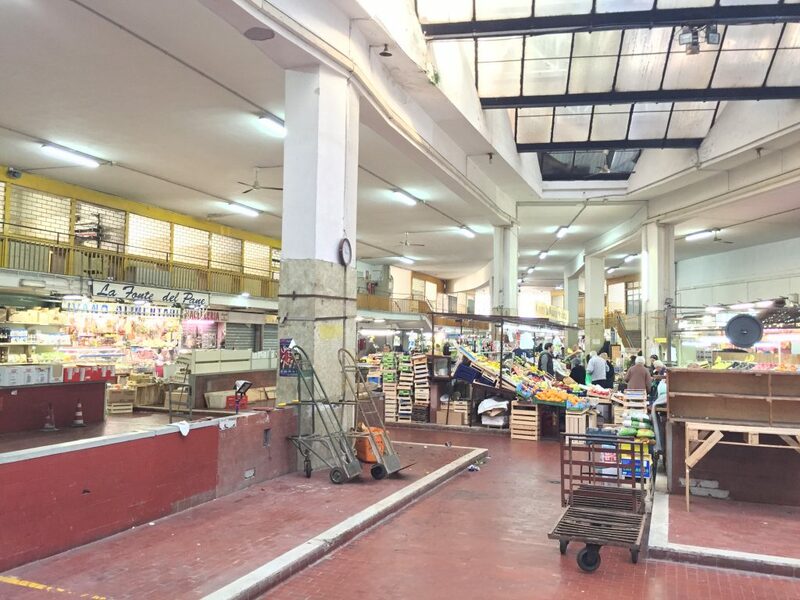 In the “Flaminio Due” neighborhood market we witnessed a restoration project paid for by the operators. We would have liked to demonstrate that such an alternative was feasible but the reality is that most of the markets out there require a much more important and time consuming structural renovation. Such a complex situation demands an effort by the administration in order to create a specific working group, different from the labor unions, which are often non representative of the operators’ interests. Going back to your initiative, what are the results you have achieved so far and what are your future goals? So far, the tangible work of the initiative is disclosed in our book entitled “ A market is not only a market”. We have experimented its potential by showcasing the book in many Roman markets. It has been a useful experience for us to understand what the real problems of neighborhood markets are and how they can be solved. First of all, we noticed that markets are nowadays neglected spaces and not consideredattractive. Moreover, markets should dispose of recurrent training courses for operators, because as of now this category is very seldom stimulated/ incentivized/motivated. For instance, many operators don’t even have an e-mail address, which means that they are completely excluded from a huge network of information, incentives, and possibilities stemming from the digital world and the forms of fast and efficient communication with the institutions it offers. We are witnessing a digital divide phenomenon. We could solve it by including a space dedicated to young startups in every market, which could contribute to reduce such digital divide. However, it is not up to us to initiate such a process, as we are incapable of doing so. What we can do is reach out to public institutions and organize the operators’ requests. Our idea of an active citizenship is about triggering institutional action and not substituting it. We are therefore ready to cooperate with the public sector. The problem is that we cannot afford to continue working on our own, only counting on our own strength. People think that the main issues of Rome derive from structural and economic shortcomings, or from a lack of funds for restoring sidewalks, bumpy roads, and for working on urban renewal in general. I actually believe that these tangible urban conditions are the mirror of a human and anthropological dimension. This is to say that the same damage one can spot on a street is also palpable in the communities that populate the city. We witnessed a process of weakening of human relationships, which also unfolds in markets as a loss of a collective consciousness capable of uniting the workers. Hence this situation requires a set of cultural initiatives to target human relationships, involving people and raising awareness on the importance of positive relationships in markets and neighborhoods. The weakening of human relationships is definitely tied to the lack of public spaces. Space in Rome is increasingly becoming privatized. The few public spaces left are hardly available to citizens. As a matter of fact, bureaucracy represents another huge obstacle. If the private sector is able to quickly overcome bureaucratic obstacles, often times citizens requests, instead of being prioritized, face insuperable impediments. I believe that this is all due to a kind of resignation and to a social dimension which has abandoned the traditional fight in defense of collective rights, and limits itself to family and neighborhood relationships. Change in Rome is hard to achieve because the city has unfortunately passed the point of no return. It would require incredible strength, capabilities and a foresight that it is hard to find. Community, Governance / Shared administration, Rome , advocacy, agriculture, commerce, education, heritage, market, renovation.